VPL 8916. 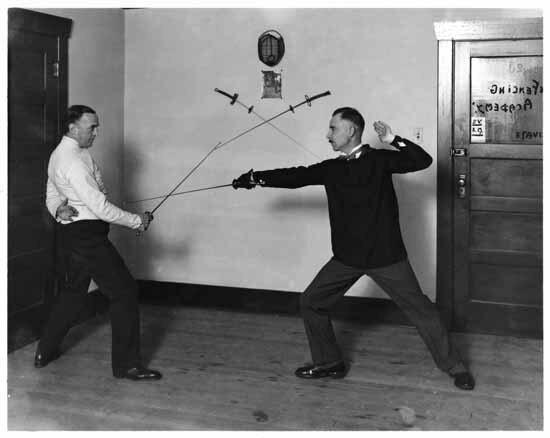 Sir John Martin-Harvey (left) and Russian Prince Volkonsky (right) fencing at the Fencing Academy in Vancouver. 1926. Stuart Thomson. Sir John Martin Harvey had a reputation as a Shakespearean actor on the stage and (later) as a silent film star in the U.K. and in the wider world, not least in Canada. The Russian Prince pictured above with Sir John was, however, at the time this photo was taken (post-Russian revolution), a relative nobody. CVA 99-1533 – Prince Volkonsky. Passport photograph. 1926. Stuart Thomson photo. It seems to me likely that while his missing parents may have motivated his travels early on, surely by the time he reached Canada nearly a decade later, his motivation would have become, at least, mixed; that the principal reason for his being in Canada was to put down roots. Caricature of Sir John Martin-Harvey. Maurice Willson Disher. The Last Romantic. London: Hutchinson & Co., 1948. Of course, after the Russian revolution, the whole Pacific coast was littered with desolate refugees from that unhappy country. Vancouver was full of them . . . . Prince Volkonski . . . was haunting afternoon tea parties for the bread and butter he could unnoticed consume . . . . He had been in turn insurance agent, bill poster, waiter and actor. When my wife and I met him he was trying to teach the youngsters of Vancouver the elegant accomplishment of fencing — with scant encouragement. He thought that if I would visit his salles d’armes and allow myself to be photographed for a picture-paper in the midst of a bout with him, it might help. This I was delighted to do, and found myself credited by the newspaper with the reputation of being the finest swordsman in Europe! The youth of the city, however, were unimpressed, and the school was shortly afterwards closed. (The Autobiography of Sir John Martin-Harvey. London: Sampson Low, Marston & Co. 1933, pp 435-36). From the McGill University College of BC Annual – 1913 (p.69). UBC Open Collection. There is no evidence in Vancouver directories of there being a dedicated fencing academy in the 1920s. 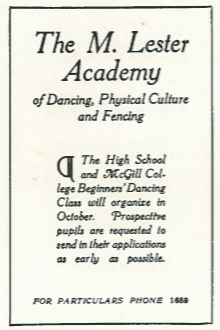 The only sign I’ve seen of there being any school in the city which included fencing on its curriculum was an ad for M. Lester Dancing Academy. Judging from Martin-Harvey’s remarks, though, I take it that Volkonsky had established his own studio. It seems plain from Sir John’s report (and, reading between the lines in the Tribune article, too) that Volkonsky was tired out, hungry, and desperate to establish himself in a new, friendlier nation. But I’ve been unable to find out what ultimately happened to Prince Volkonsky.¹ I can find no evidence that he ever became a naturalized Canadian (sheep farmer or otherwise). I have not even been able to ascertain where he died and was buried. Indeed, the later years of Sergeie Alexandrovish Volkonsky seem to be every bit as clouded in mystery to contemporary researchers as were his parents’ latter years to him! This entry was posted in politics, sport, stuart thomson and tagged bc, Dominic Lieven, fencing, history, M. Lester Dancing Academy, Prince Sergei Alexandrovish Volkonsky, Sir John Martin-Harvey, vancouver. Bookmark the permalink.